I grew up eating good simple food. Most everything cooked from scratch and nary a store-bought mix to be found. My Mom wasn’t a fancy cook but rather a meat and potatoes kind of gal, but oh, did she know how to make those meats and potatoes taste good! I especially remember new potatoes and short ribs. Yum! No fancy ingredients but oh so good. My Dad was an organic gardener even though he had no idea what organic meant. It just didn’t make sense to him to put poison on the food then eat it. He did, however, smoke a pack of cigarettes every day. Life is never black and white. My Grandmother, on the other hand, was a terrible cook. 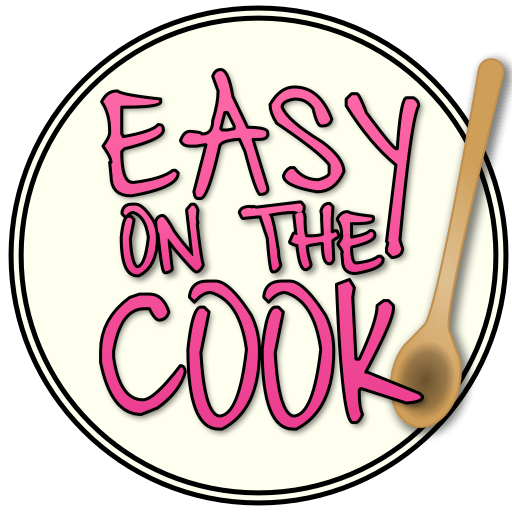 She got to a point in her life where everything she served came prepackaged or out of a can, and believe it or not that was an improvement from her previous culinary escapades. Nothing like a canned whole bone in chicken, complete with the goopy spam-like jelly, and canned jello type salad complete with extra mooshy marshmallows to make you be sure to eat BEFORE you head over to Grandma’s house. 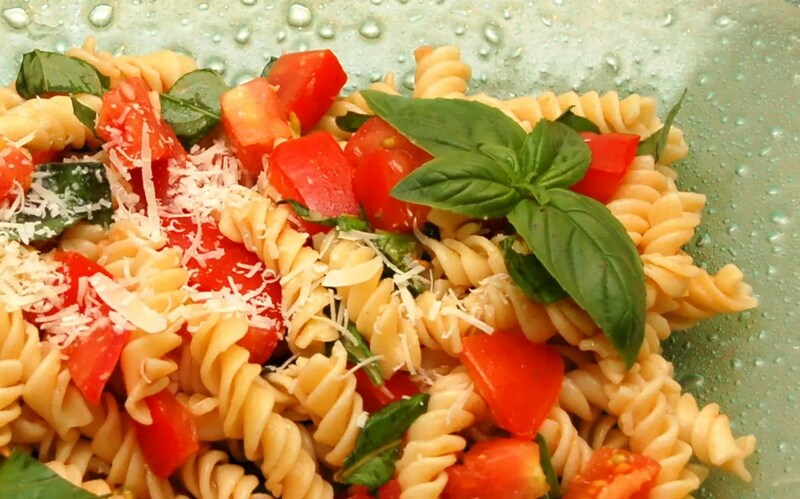 Today I present a nice easy Fresh Tomato and Basil Pasta Salad. Simple fresh ingredients at their best. We eat a lot of this at our house in the summer thanks to those patio tomatoes and the pots of fresh basil I just can’t resist buying this time of year. Sometimes instead of plain pasta I will use a cheese tortellini and serve it as a meal; otherwise it’s a side dish – really nice with grilled fish. About 4 hours ahead of time chop the tomatoes and put in a large bowl together with the basil, vinegar, olive oil, sauteed garlic and salt and pepper to taste. Let sit. Simple fresh ingredients at their best. 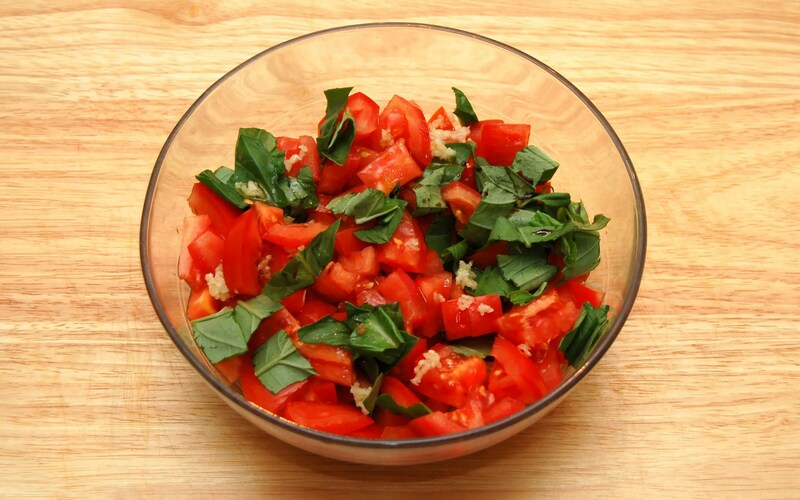 About 4 hours ahead of time, chop the tomatoes and put in a large bowl together with the basil, vinegar, and 3 tablespoons of the olive oil. Sauté the garlic in a bit of the olive oil in a pan over medium heat for about 2 or 3 minutes. Soften the garlic, but don’t let it brown. Browned garlic tastes bitter. Add cooked garlic to the tomato mixture along with salt and pepper to taste. Let the mixture sit at room temperature for about 4 hours. 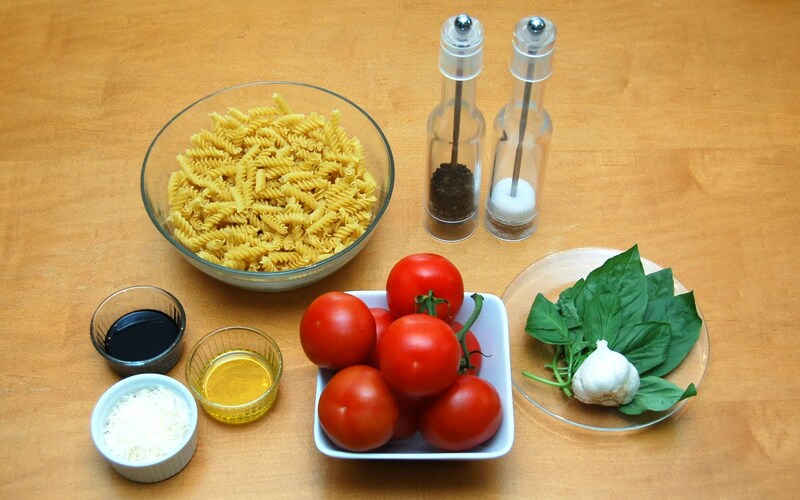 10 – 15 minutes before you are ready to serve, cook your pasta according to the directions on the box, in salted water. When done al dente (you don’t want it mushy for the salad), drain, then toss with 1 tablespoon of the olive oil and the parmesan cheese. Pour the tomato mixture over the pasta, gently toss and serve. I brought your salad to a birthday party this week & it was a hit! I decided to go with the tri-color cheese tortellini from Sam’s as the base & the only thing different I added was some fresh mozzarella because I love it paired with tomato & basil so much. It was a nice addition but I’m not sure it was needed. Thanks for another winner! So glad it worked well for you. I love the addition of fresh Mozzarella! Good idea! Thanks for the feedback!